Halloween Party Candy Tins - Personalized Halloween candy tins are a lovely Halloween Party favor keepsake for you and your guests that will actually be used. Personalized candy tins are a fun, unique and inexpensive Halloween Party Favor. You can order our personalized candy tins filled with candy or without. And finished off with tulle and a satin ribbon. A photo can be added at no extra charge. Email photo to sales@anyatyler.com. Choose one of our personalized Halloween candy tin theme labels below or we can create a custom label to coordinate with your Halloween Party theme. Your guests will be thrilled with these yummy Halloween Party Favors! 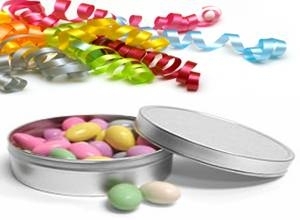 Our personalized Halloween Candy Tins can be filled with your choice of of Candy: French Mints, Licorice Pastels or Teenie Beenie Jelly Beans.